time,  who  could  have  an  impact  on            stakeholder maps for each. ness targets. In order to plan a more              As a result of these studies, it was re-                                                 Internet based Applications; Ethics Rules, Corporate Website (all year long). ers of each company in the group in                Communications  were  coherent. The                                                     long). representatives  of  each  group  com-             Communication Platforms. 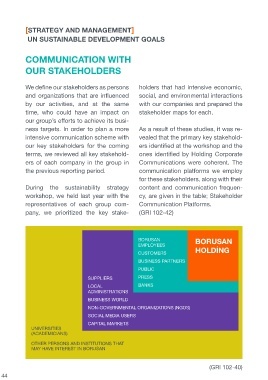 pany,  we  prioritized  the  key  stake-           (GRI 102-42)                                                                             Meetings and Interviews; Supplier Evaluation Surveys (all year long). BORUSAN                   BORUSAN                                                         Meetings and Interviews, Social Media (all year long). BUSINESS PARTNERS                                                                         tinuous); Social Media (all year long).